THREE Sun Prairie neighborhoods already made goal! Wow—you guys didn’t waste any time, did you? Congratulations, Neighborhoods B, C and S—you made your registration goal! You’ve guaranteed a spot in the build plans and will get to enjoy all of the benefits of fiber technology. 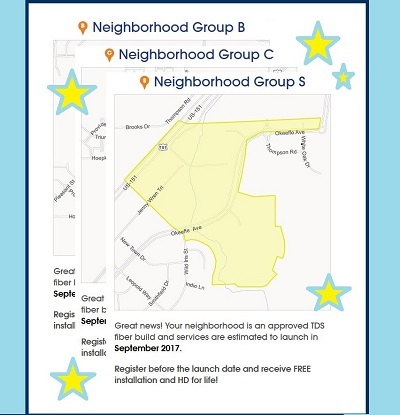 Deal alert: if you live in any of these three neighborhoods and haven’t registered, you should still get out to TDS Fiber and make it happen. The free installation and free HD for life offers are only good for folks who register before their neighborhood’s deadline. A quick look at the TDS Fiber neighborhood maps tells us other neighborhoods are getting close. In fact, we won’t even talk specific numbers because the registrations are changing hourly. 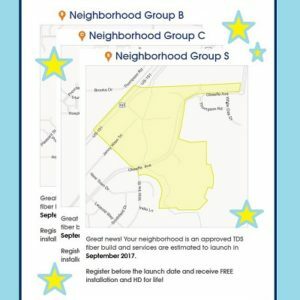 Remember, you can’t get fiber technology—or free installation and free HD for life—unless enough homes in your neighborhood register for TDS Fiber. Really, there’s every reason in the world to go ahead and sign up. You’ll get the fastest-speeds, the best technology, plus offers latecomers can’t score. If you’d like to talk with us in person, keep an eye out for our door-to-door team. They’re out and about in Sun Prairie (and will be!) so chat them up and ask them any questions you have before you register. Thank you so much for your enthusiastic response. We couldn’t be more excited to become part of the community and bring you world-class internet speeds. From the looks of things, you’re excited too! 4 Responses to THREE Sun Prairie neighborhoods already made goal! Am trying to get ahold of Erik Smith. I need to ask a question regarding where they are going to dig to put the fiber. I think he said around the gas line. I don’t think the gas company would agree to this. Gas lines are dangerous and I don’t want it dug up by my residence, which is on a gas line. If you dig up on my residence, I will cancel through tds. I sent your comment on to Erik and also to the gentleman who is heading up the construction efforts in Sun Prairie. You should be hearing from one of them soon. Thank you! I would like an status update as to when we will connected to TDS? Diane, I don’t know exactly where you live in Sun Prairie, but launch dates listed on TDS Fiber on target. If your neighborhood has launched and you’ve placed your order, we’ll be calling you to schedule your install soon!